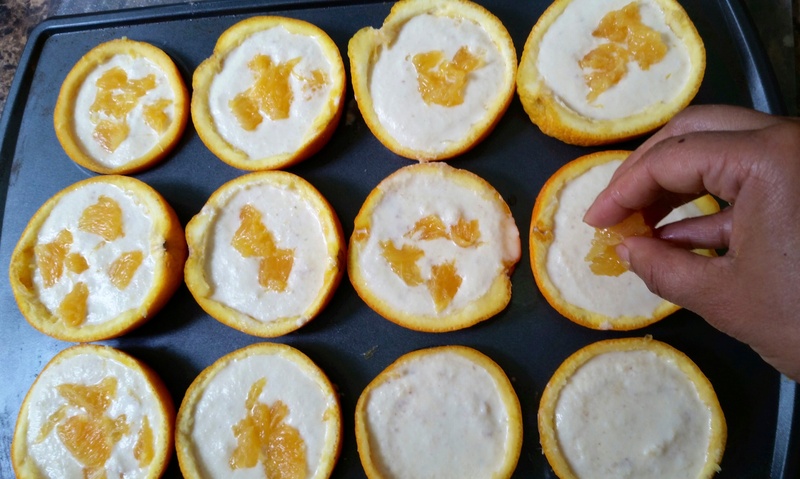 Presenting Refreshing Orange Kulfi Bites. 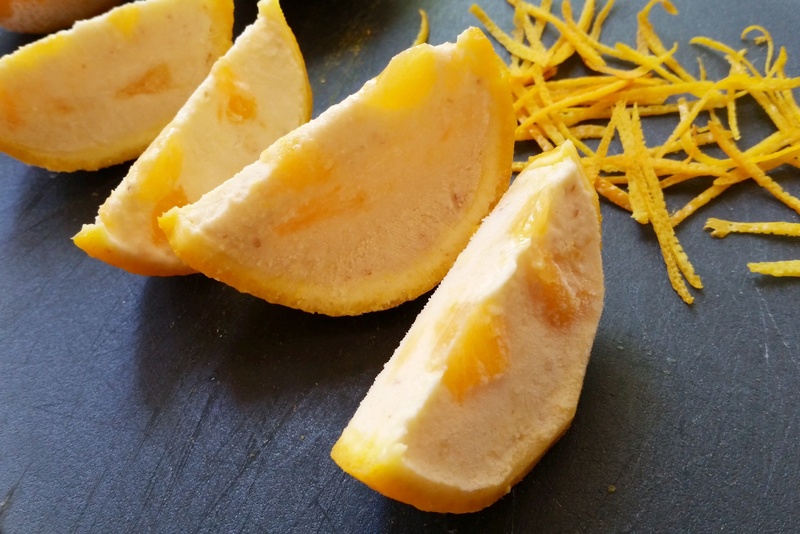 Creamy Kulfi, with a burst of tangy citrus orange flavor, charmingly presented in its own shell! 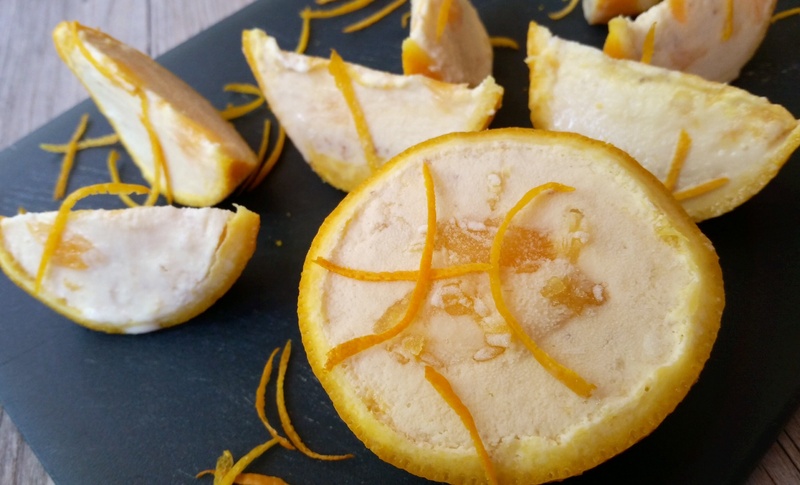 Stunningly impressive in looks, delicious in taste… yet super easy to put together, even your kids can help make this. 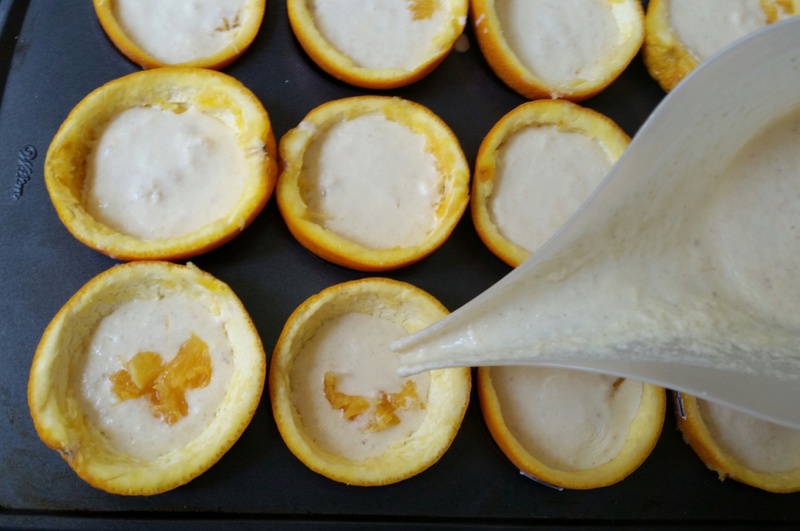 Serve these little treats as a fun dessert at your next summer party, they are sure to delight!! 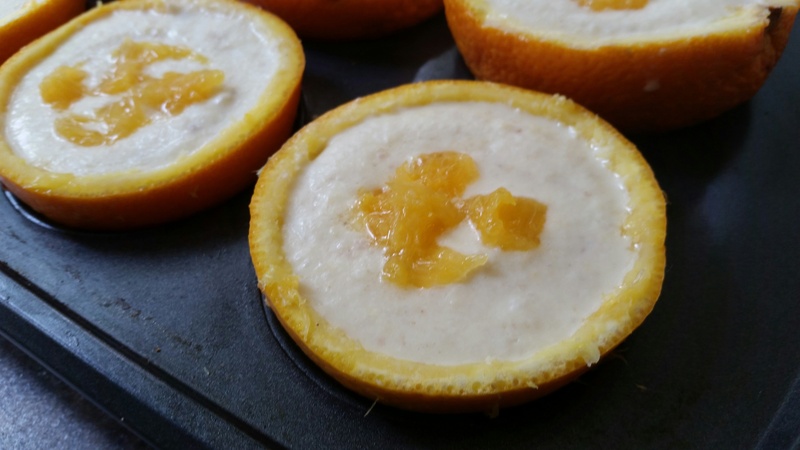 You will need 4 large juicy oranges for this recipe. Wash oranges and pat dry. 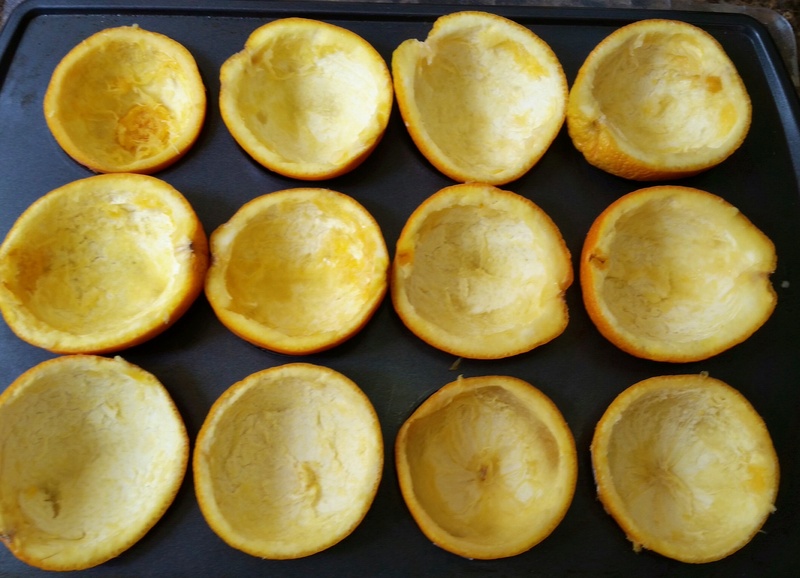 Cut each orange lengthwise. That way they sit more easily. 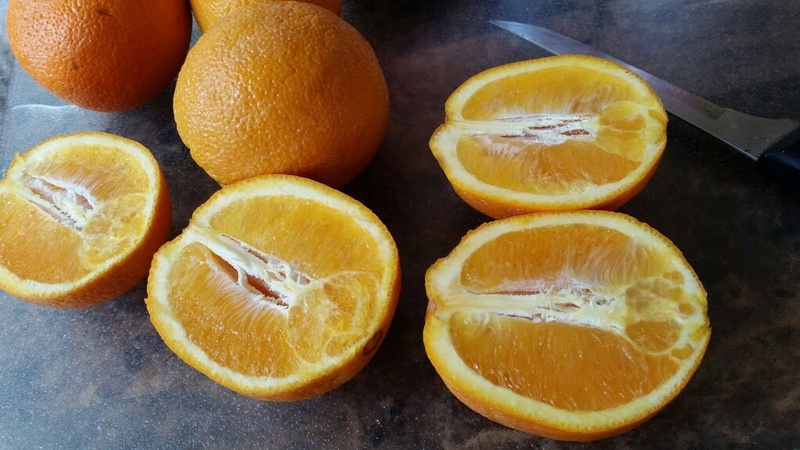 As an example, I’ve shown you the 2 ways you can cut the orange…the left one is cut right for this recipe (length-wise). 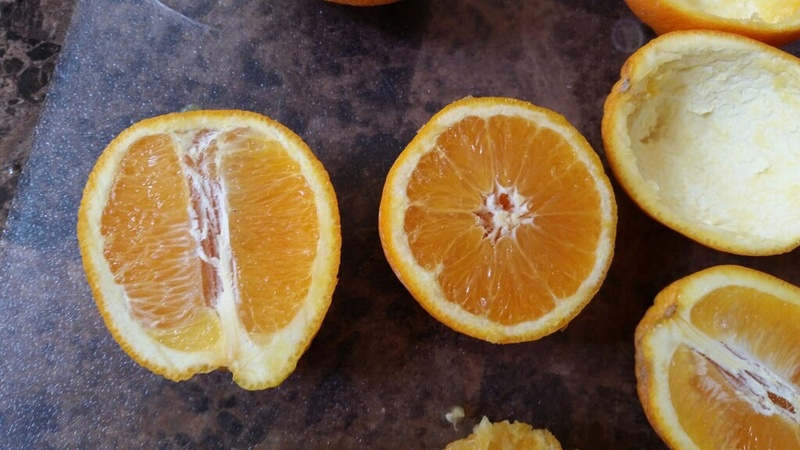 The right one is cut wrong (horizontally). 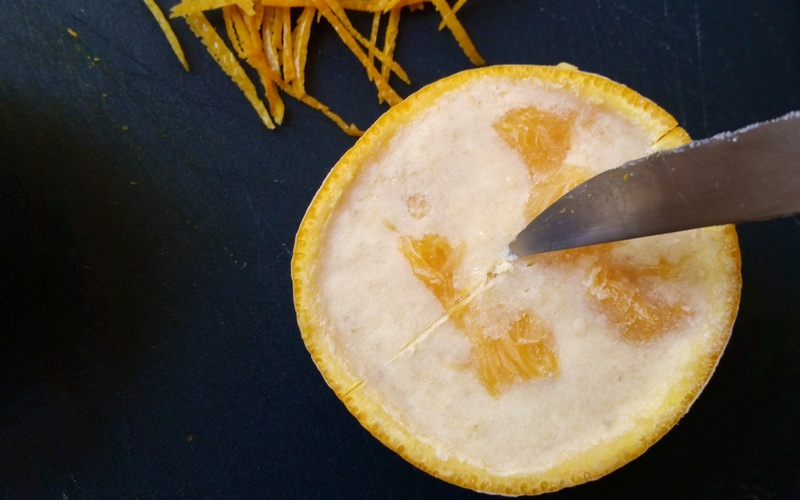 Next gently loosen edges of the orange pulp using a pointed knife. 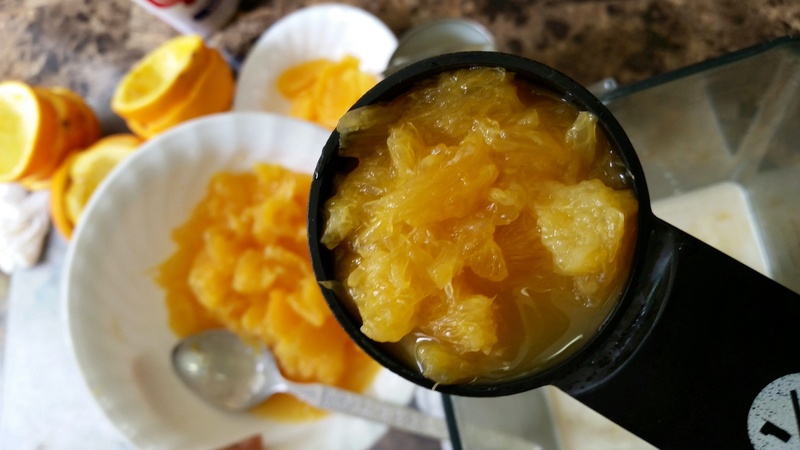 Then using a spoon, scoop out the pulp from the shell. 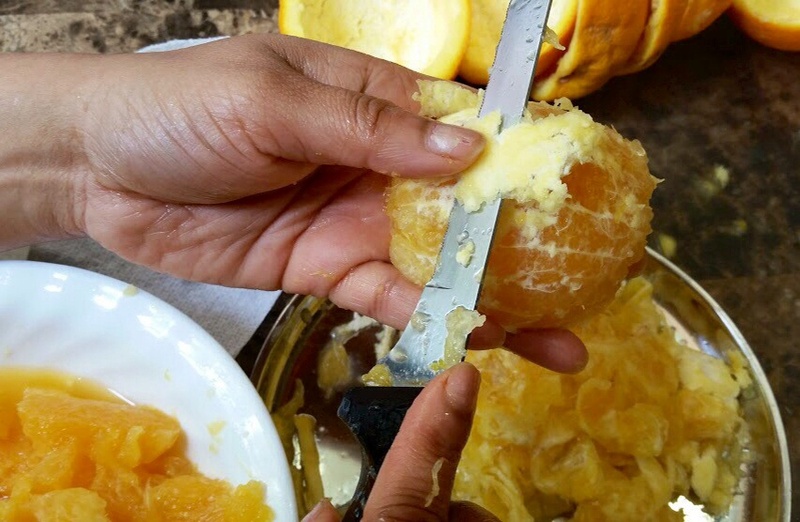 Be careful not to tear the outer shell(here you see me working on the horizontal one, I cut the first orange wrong, but used it any way). 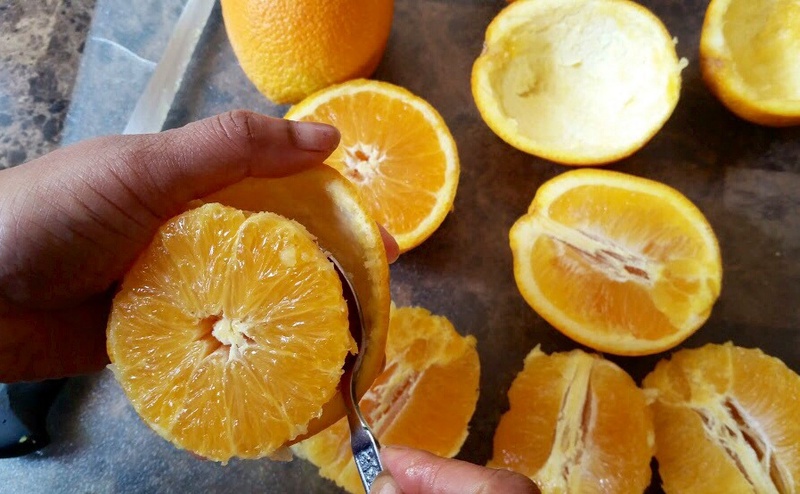 Save the pulp for later. 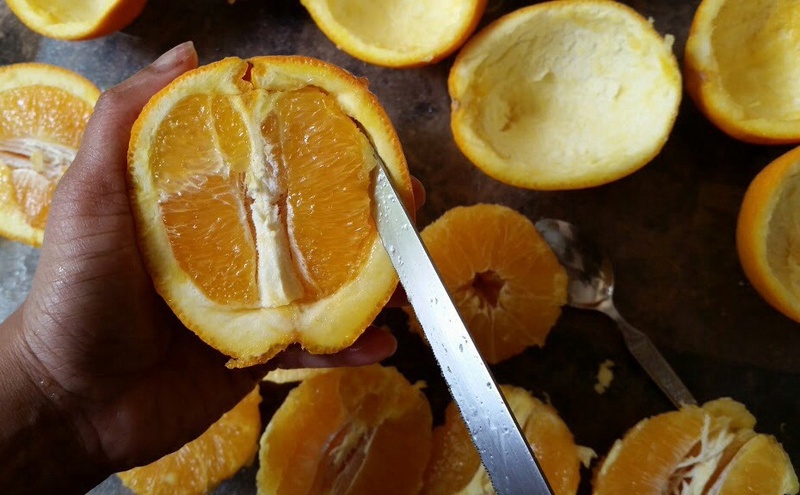 Clean the insides of the shell, pulling out any peels or debri. Place shells on a tray. 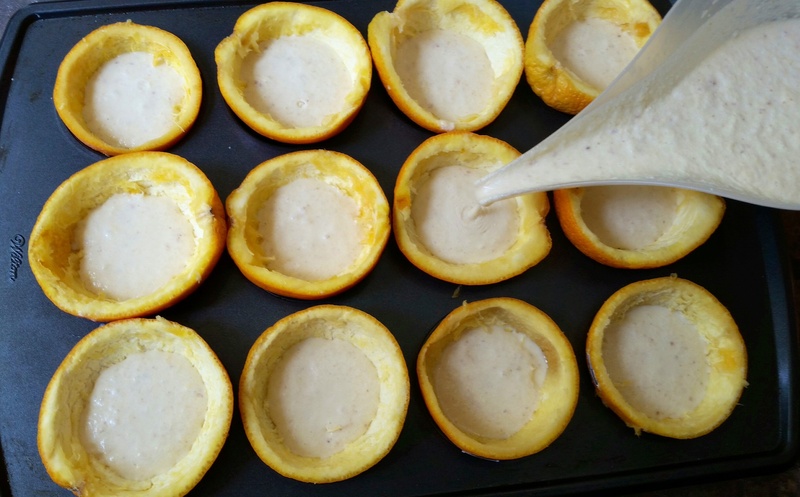 I’ve used a muffin pan, which worked great in keeping them stable and standing straight. Those who don’t own one can also rest them on little steel katoris and the place them on a flat tray. 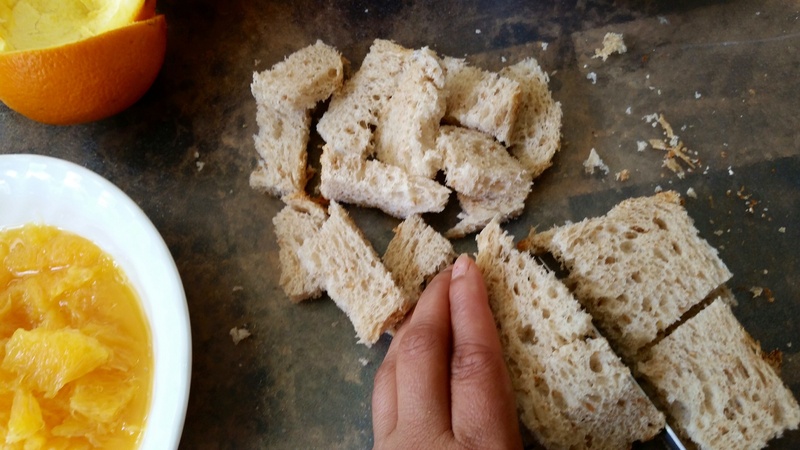 1 1/2 slice of bread, crust removed and cut into squares. 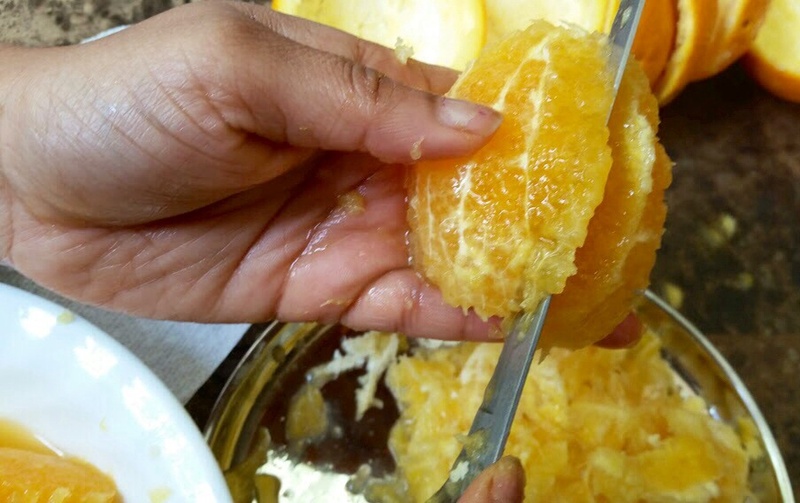 You will also need about 2/3 cup orange pulp. 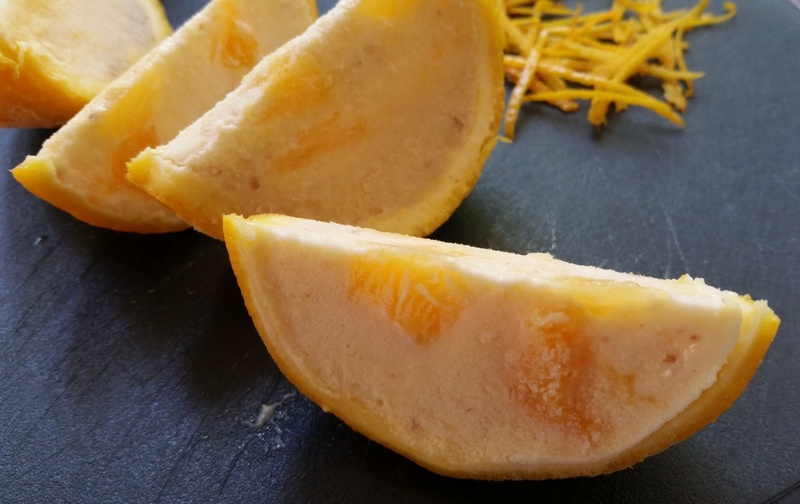 To extract pulp, remove outer white skin from the orange pulp. 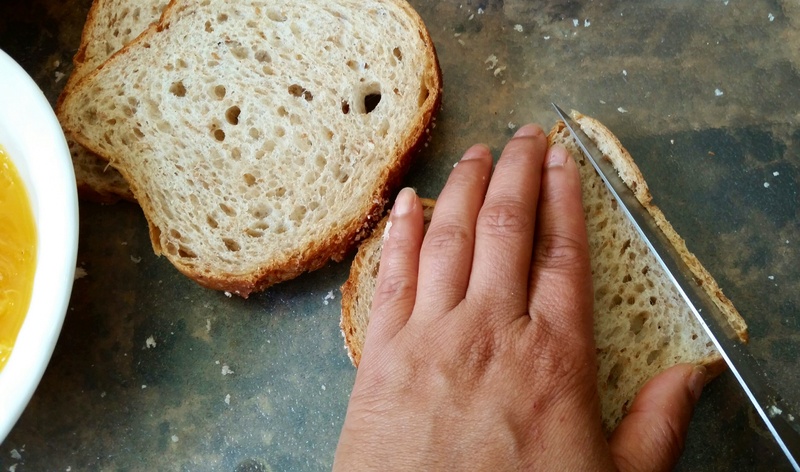 Cut out inner wedges (without peel) using a sharp pointed knife. This might take some time, but the final result will be so worth it! Reserve some pretty wedges for topping the shells if you like. 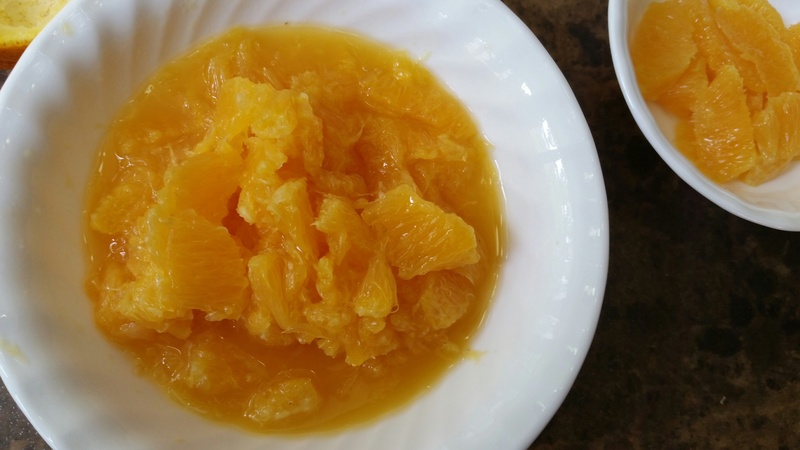 and 1/3 of the orange pulp in a mixi. 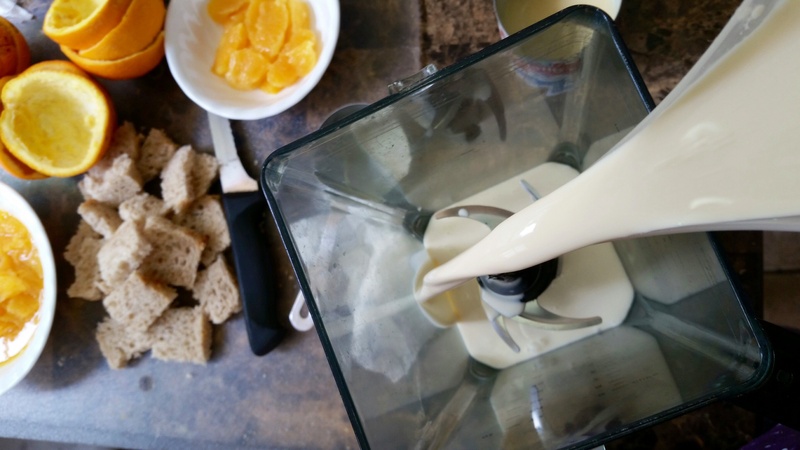 Blend the above ingredients in the mixi for 2-3 minutes. The mixture will become slightly thick n bubbly. 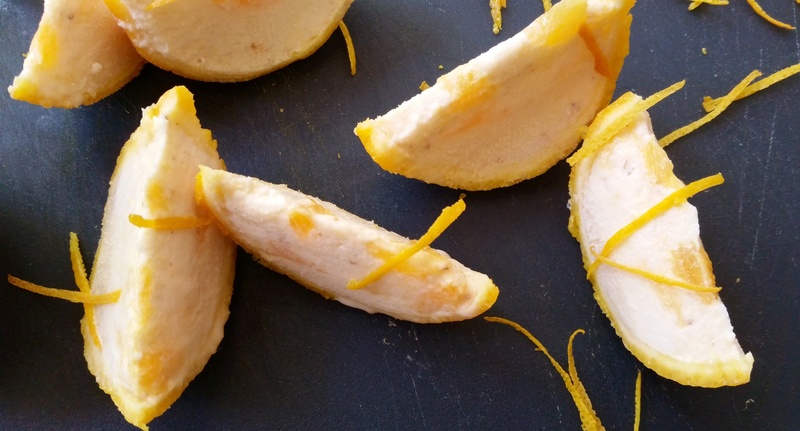 Pour this Kulfi mix into the shells till they are half-way full. 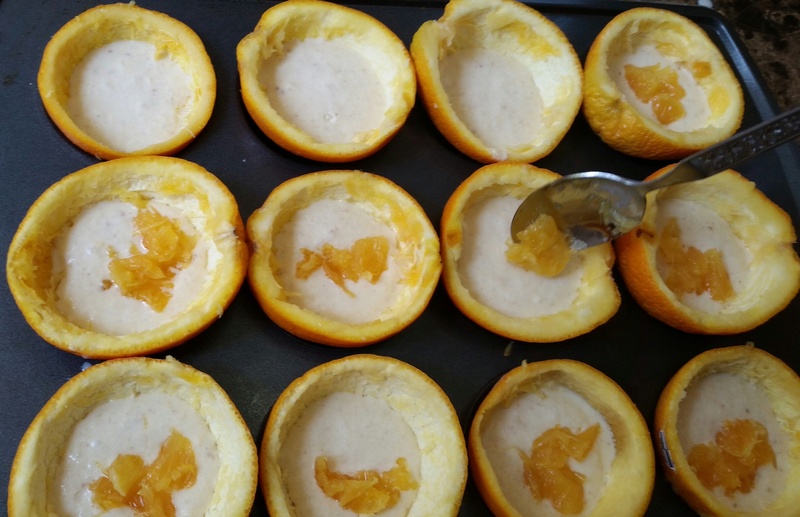 Spoon a tsp of orange pulp into each shell. Top up with more Kulfi mix, till they are filled to the brim. Gently place the pretty orange wedges on top. Carefully place the tray in the freezer to chill for 1/2 an hour. Do not cover tray with plastic wrap at this point. As the mix is still loose and will stick to the plastic wrap. After 1/2 an hour, the mix starts to set from the top. Take out of freezer. 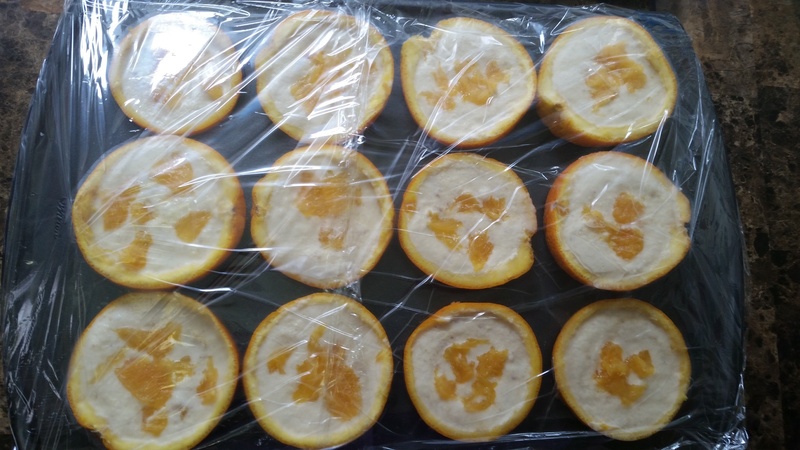 Cover with double layer of plastic wrap and then freeze the shells overnight till really firm. 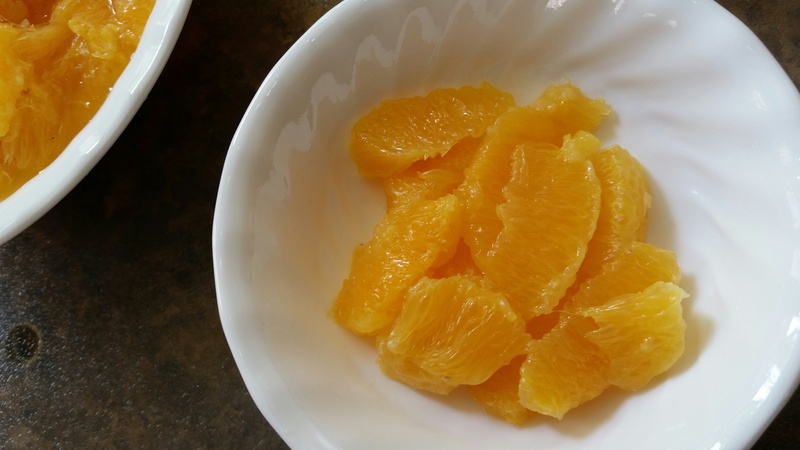 To ascertain whether orange shells are ready to cut, poke the center with a knife. If it’s still soft, freeze for some more time. Once the shells are frozen hard. Remove them from the freezer 5-6 minutes before you want to serve them. Wait for them to thaw just a little. Then using a serrated knife cut each shell into 4 wedges using a back n forth sawing action. 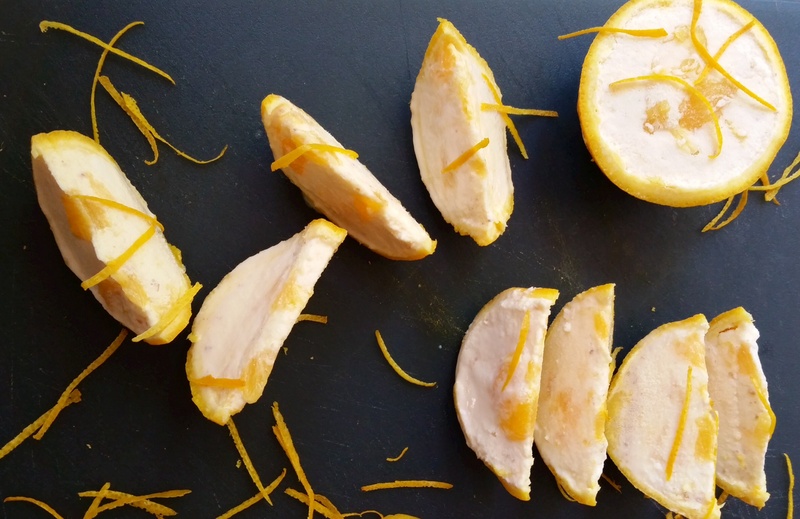 Sprinkle with julienned orange zest if you like and serve immediately! PS: For those who do not have easy access to evaporated milk. 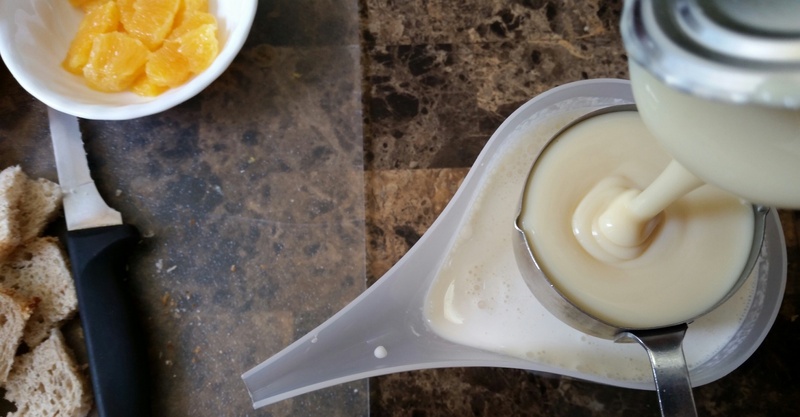 Evaporated milk is nothing but regular milk that has been reduced to 40%. 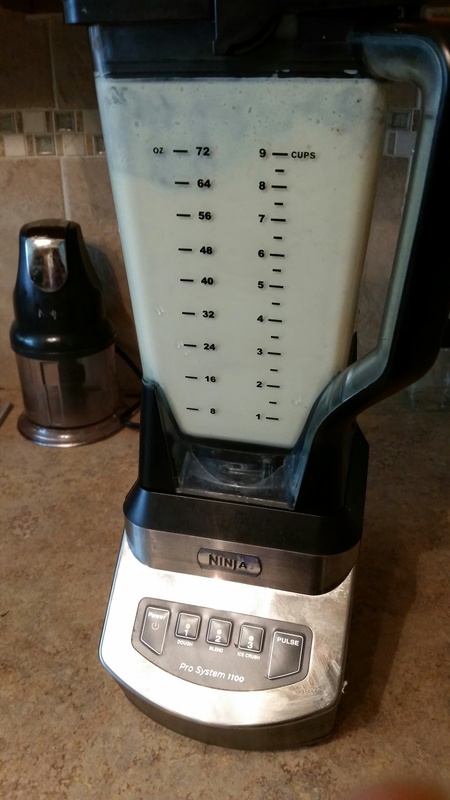 You may make it at home by taking 2 1/4 c milk, and reduce it to 1 c. Or for this recipe, take about 390 ml milk, and reduce it to 170 ml. But be very careful to stir it constantly, so it doesn’t stick or burn. Thanks dear, for trying this. Thank you so much. Your appreciation means a lot. Thanks Ruchi , we will surely try this kulfi bite. Hi Ruchi, very impressed with all your recipes. Also You explain them very well. Keep giving us your super ideas…thank you for sharing your wonderful recipes!!! Very nicely explained. Wonderful recipe. Just one question, how is evaporated milk different from normal milk n if we’re using normal milk, what different we have to do in the recipe? Thank u. 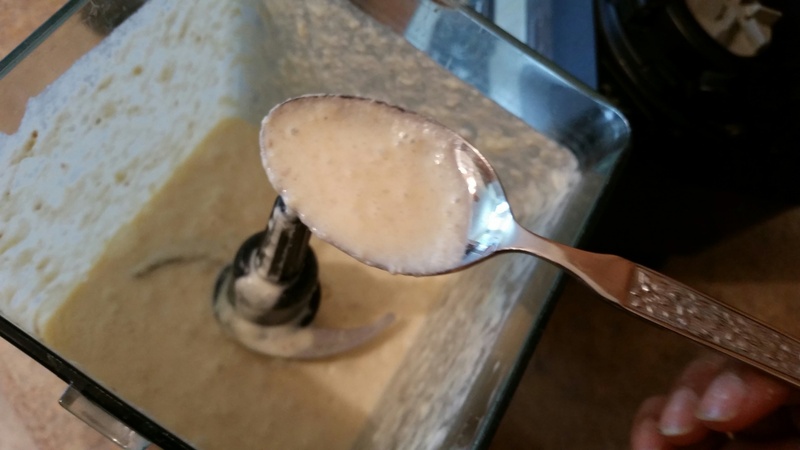 If you don’t have evaporated milk, you can also use normal milk. Evaporated milk is nothing but regular milk that has been reduced to 40%. 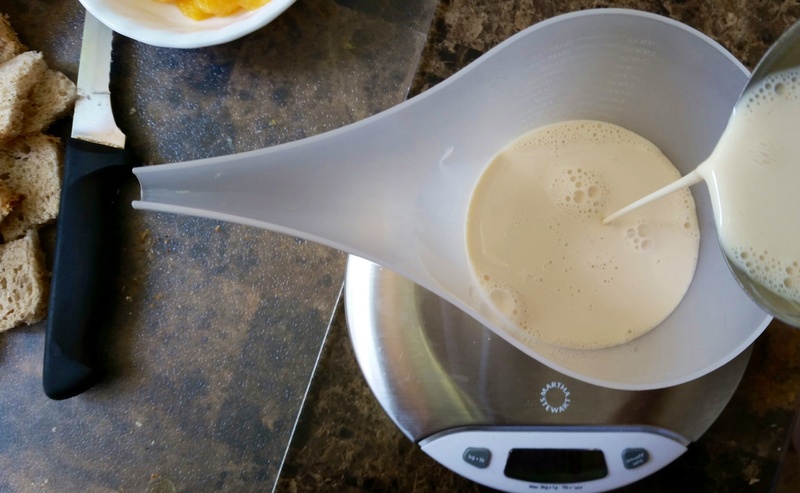 You may make it at home by taking 2 1/4 c milk, and reduce it to 1 c. Or for this recipe, take about 390 ml milk, and reduce it to 170 ml. But be very careful to stir it constantly, so it doesn’t stick or burn. Lot of patience required phew!! !